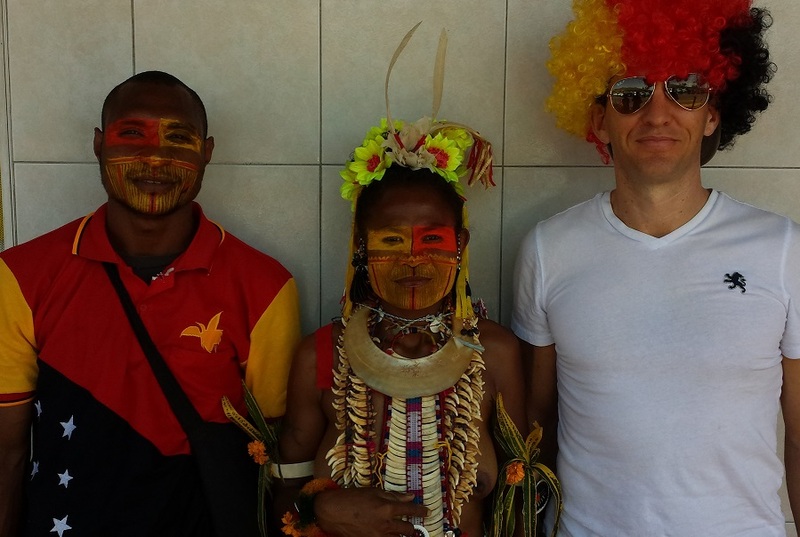 Monday the sixteenth of September was Independence Day in Papua New Guinea. As in every country, the national holiday draws out the latent national pride that lies below the surface most of the year but suddenly bursts forth as the big day approaches. 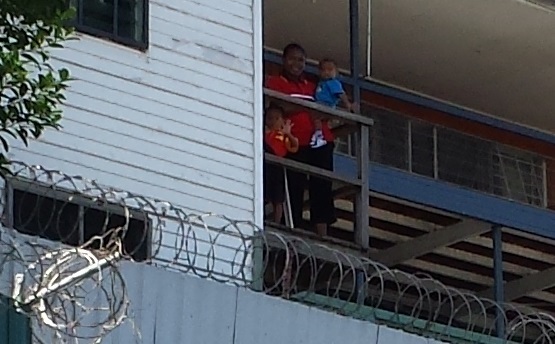 I’ve never seen such a large portion of a population dress in national colours for their special day. 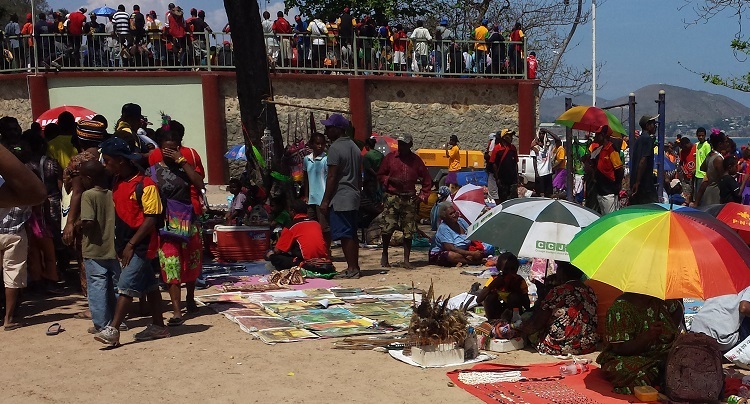 Throughout Port Moresby, vendors sprung up all around in the days leading up to Independence Day. 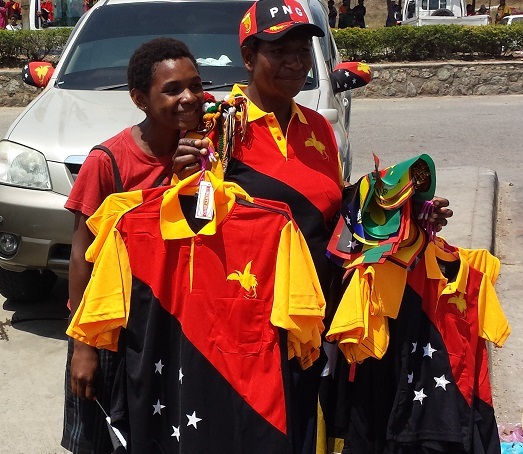 The modus operandi is to buy a shirt depicting the national flag and then to carry a flag from one’s home province. The flags end up flying from people’s cars, stuck in their hair or attached to backpacks and such. 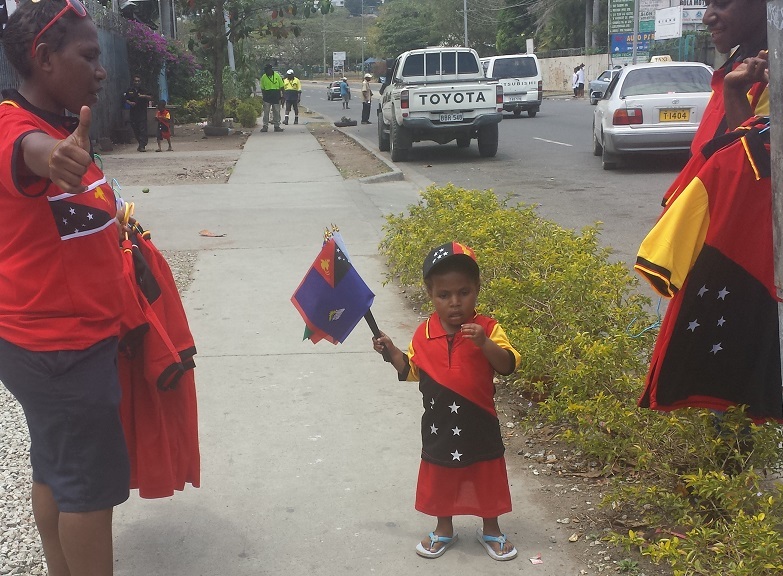 On the morning of Independence Day, the little guy who lives in my street proudly wore the PNG flag t-shirt that I bought him. Everywhere I went, I encountered people embracing the spirit of the occasion. 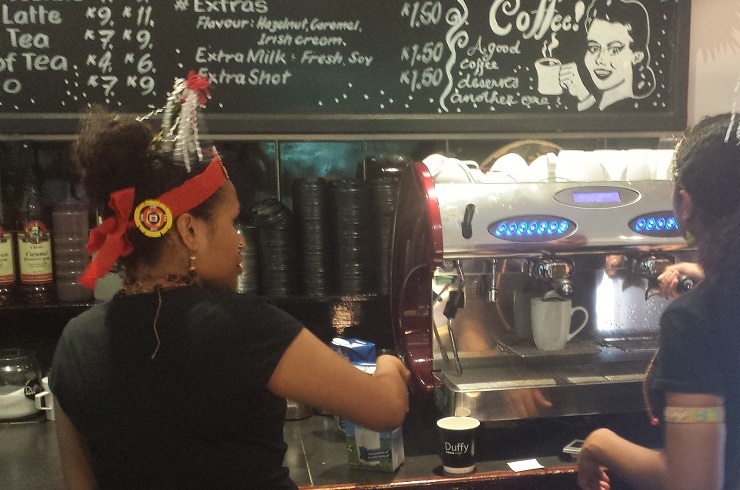 Even the Baristas at Duffy wore traditional headresses. 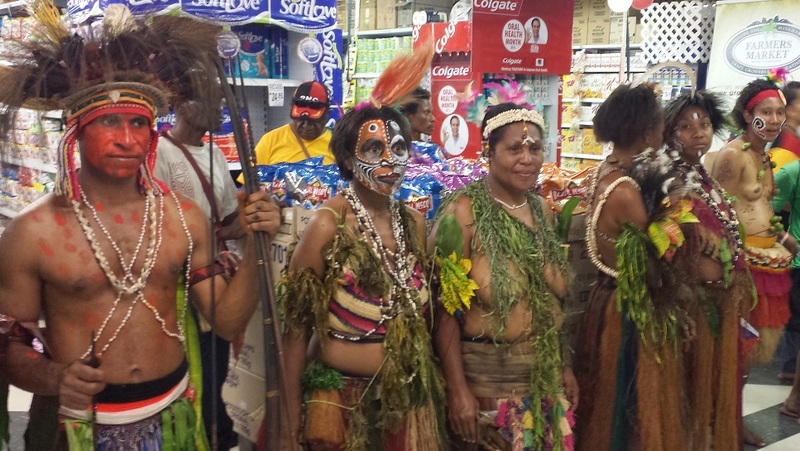 The supermarket was adorned with PNG flags hanging from the ceiling and the checkouts. Inside, people were queueing to have their photos taken with those in traditional dress. 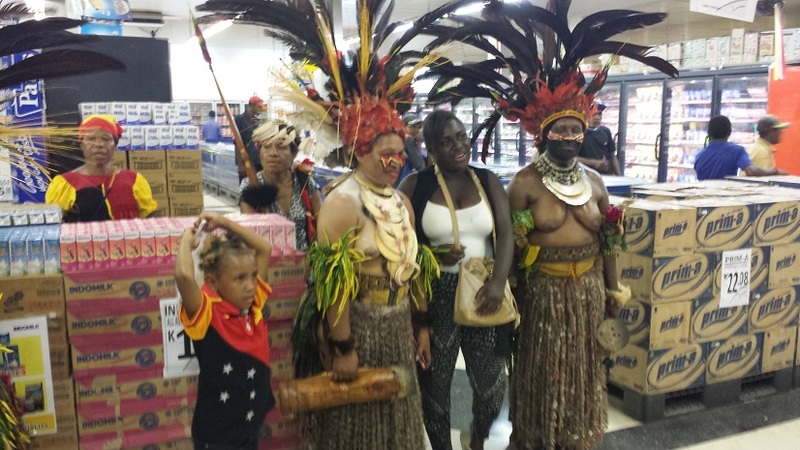 Even when bare-breasted and wearing animal skins and feathers, they still take gangsta poses, like the woman on the right in the photo below. 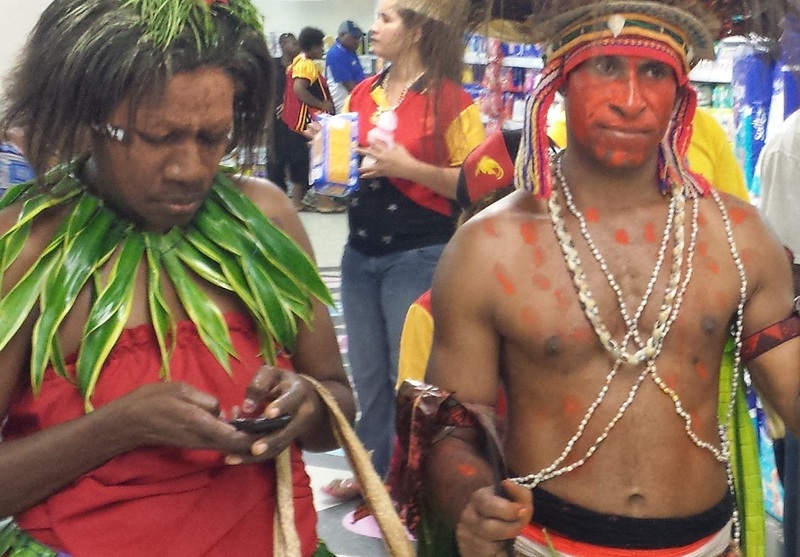 This photo depicts a fierce-looking traditional warrior, and a woman involved in a ritual of traditional Papua New Guinean SMS texting. Whoops. Slipped out of character there for a moment. 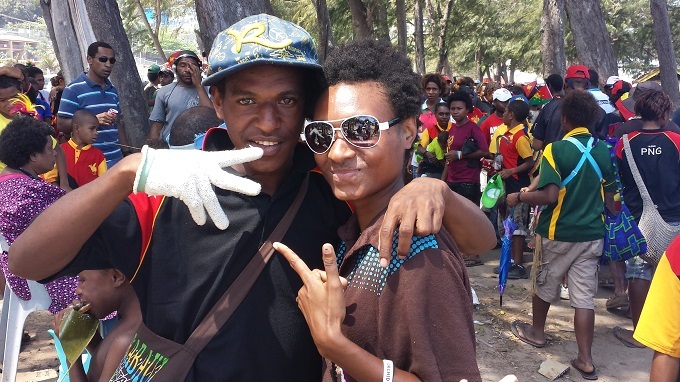 But the real action on Independence Day was down at Ella Beach, where thousands had gathered to celebrate. 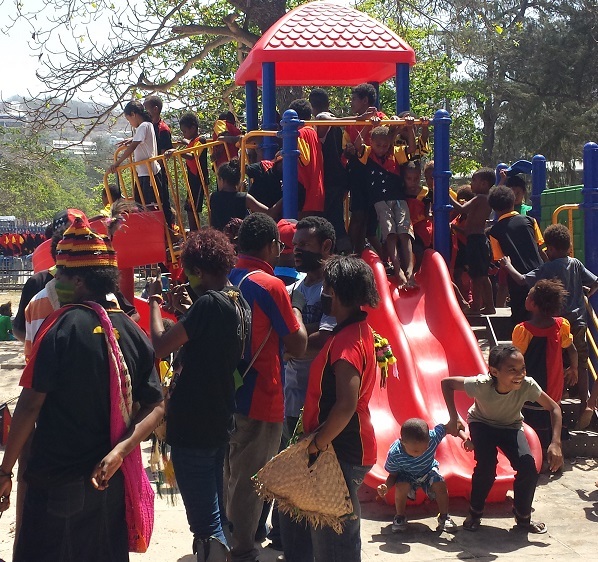 It seemed as though almost everyone was wearing something bearing the red, black and yellow flag. It was a little intimidating walking around in such a press of people. It’s exactly what all of the security briefings specifically say not to do. 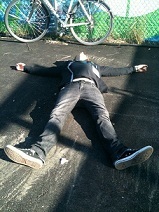 But I felt fairly safe – largely due to my outrageous wig. People liked it so much that they were stopping and asking to take photos with me on their phones. 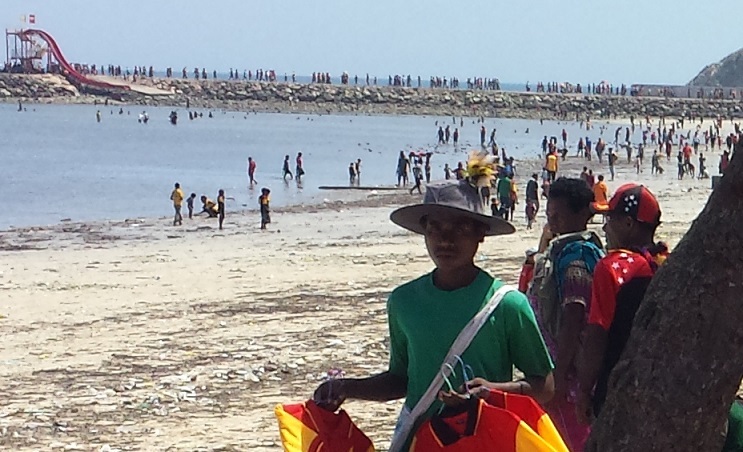 The beach was overrun with people. 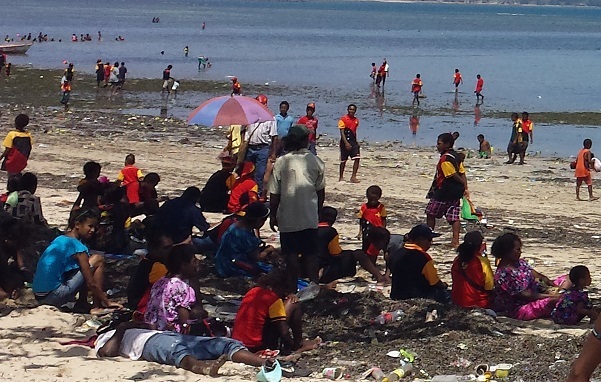 It wasn’t clear whether they were just playing in the water or searching for seafood. 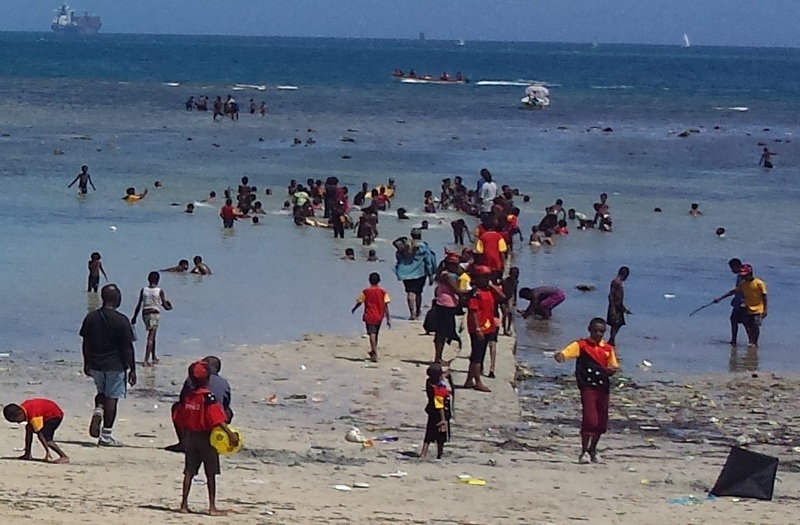 But with the tide out, they were certainly making the most of it. 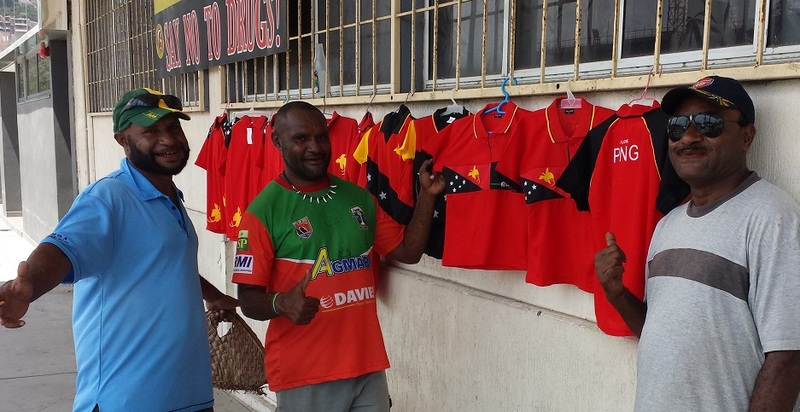 If one hadn’t already bought some national flag clothing, there were still opportunities. 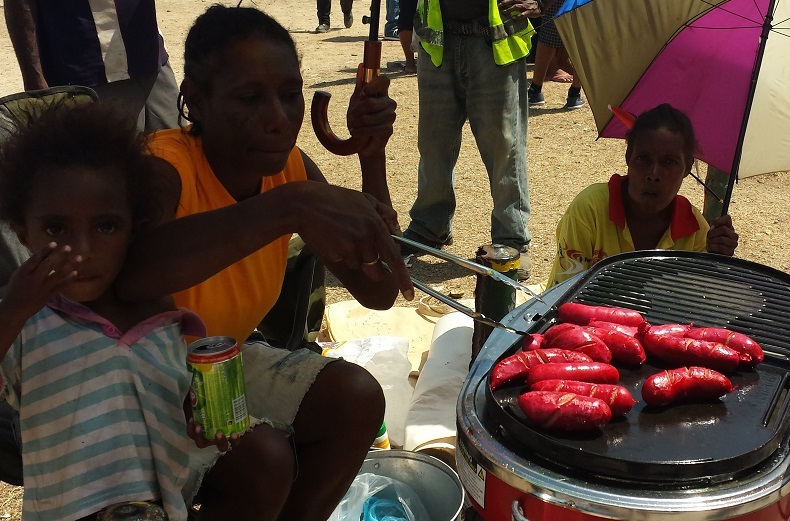 Some people packed a BBQ and were selling fried food – Saveloy sausages, fish, etc. 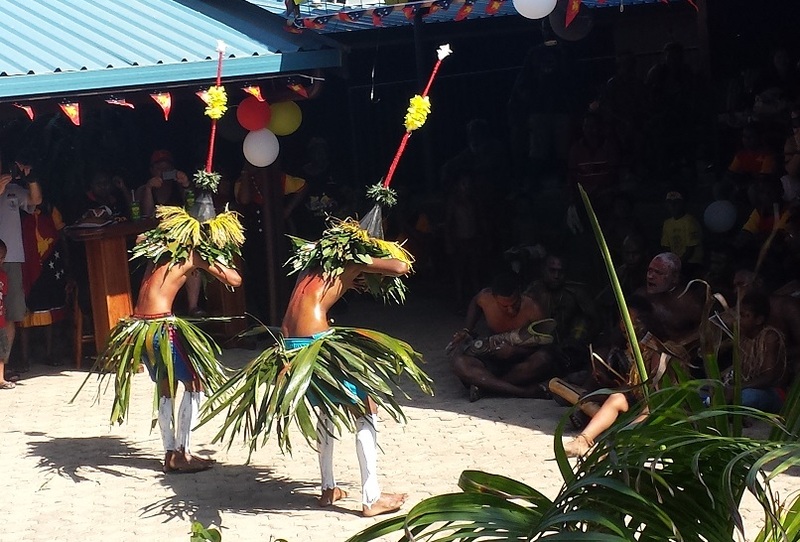 At the little stadium on the beach, live music and traditional dancing were on display to entertain the congregation. 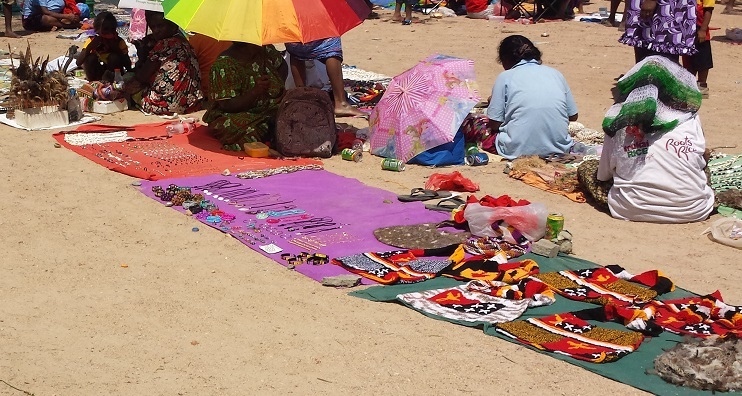 And artists were selling their wares outside. I picked up a couple of souvenirs and small gifts to bring home. 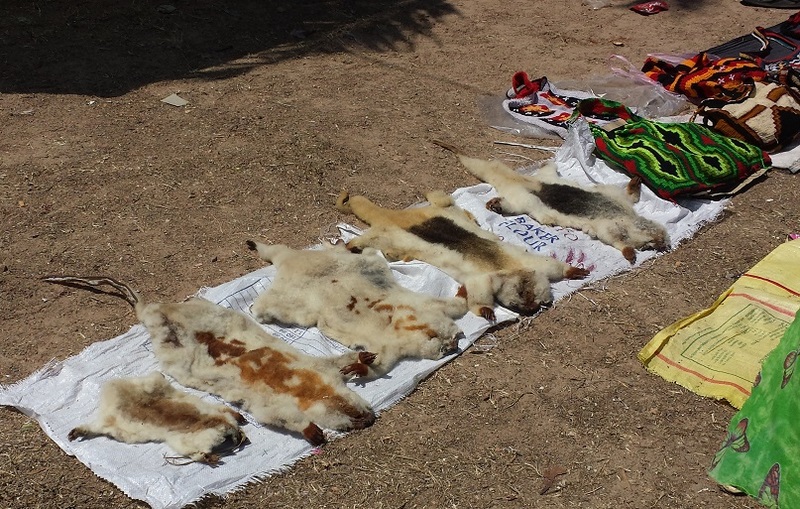 I was saddened by the furs of those cute little beasts that are sometimes sold around town. 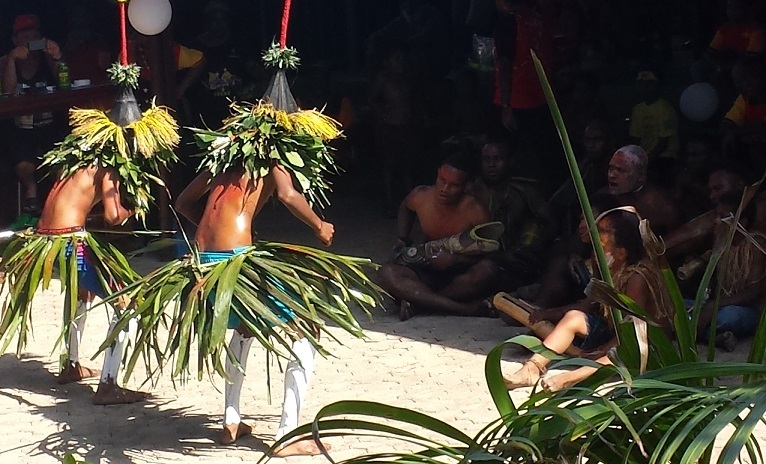 They are used as part of the traditional outfits – usually hanging across the person’s back. After a while I tired of the crowd and had seen enough so I decided to see what else was happening around town. On the way out, I passed a band that were waiting with their equipment for their time slot on the big stage. Next stop, was one of the clubs of which I am a member. 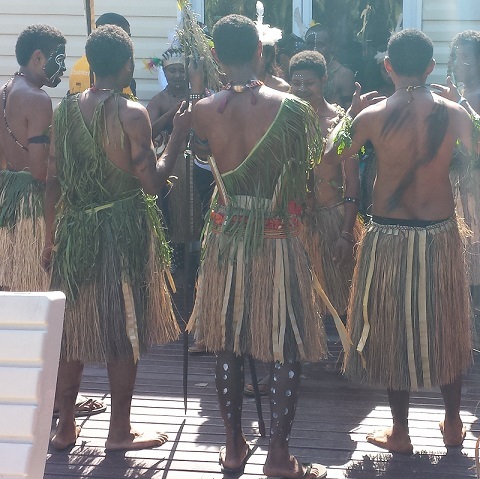 They too had folks in tradtional outfits, with music and dancing. I liked these fellows with their extra tall hats. In a world that is increasingly homogenous, it was refreshing to see something truly unique. 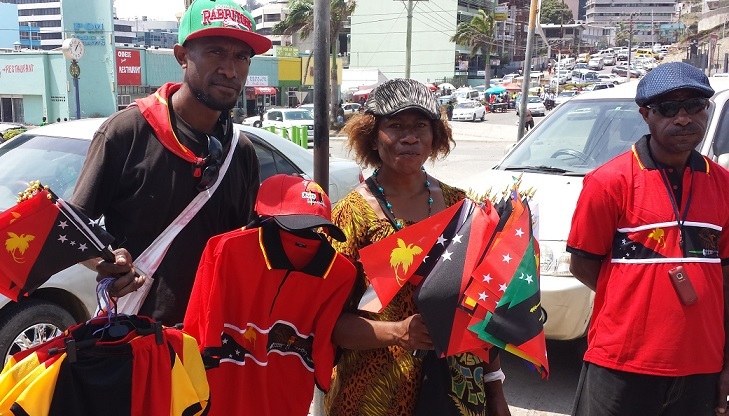 Papua New Guinea remains one of the most culturally diverse countries in the world, and one that is far less affected than most by globalisation. So far, that is. But of course, that is changing rapidly. I feel privileged to be able to enjoy and appreciate one of the few places on the planet that is still somewhat untouched.